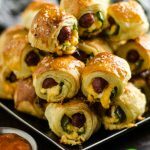 I originally made these Jalapeño Popper Chorizo Taquitos with Creamy Avocado Sauce to prepare for my Cinco de Mayo / birthday party. I figured I could make them now, freeze them, and be ahead of the game for once. That was the plan, though, at the beginning. Things derailed pretty quickly when I made the huge mistake of tasting one before I was going to wrap the remainder up to be frozen. And then, because I’m not some wicked woman who flaunts tasty food in people’s faces and doesn’t let them eat any, I offered one each to James and Mike. And, well, next thing I knew, half of them were gone. These things tend to happen when we really enjoy a recipe in this house. Can you blame us though? Here’s what we had going on: spicy crumbled chorizo mixed with plenty of hot jalapeno peppers, absolutely smothered in cream cheese and cheddar cheese, all rolled up in crispy fried corn tortillas. And as if that wasn’t enough, I topped them off with a cool, creamy, tangy avocado sauce to balance everything out. 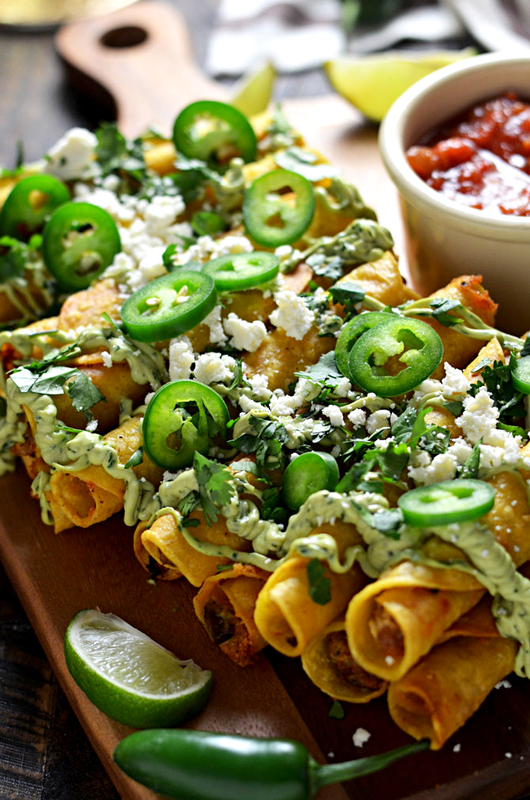 Now, you don’t necessarily need the avocado sauce– the taquitos are plenty good on their own. But because I would never want to lead you astray… you need the avocado sauce. You need it for these taquitos, you need it for tacos, you need it for burritos, and you need it for nachos. It’s so incredibly simple but I’m telling you, I could eat it on anything that had even the slightest hint of Mexican influence, and I’m pretty positive you’ll feel the same way. If you’re going to make these ahead of time and then freeze them, you’ll want to do it before you pile on all of the toppings, though. Some things just don’t freeze and reheat as well as others, so save the sauce preparation, boat load of chopped cilantro, and crumbled cotija for after you’ve reheated these little guys. I like to make taquitos ahead of time for parties (obviously) or late night snacks, but to be honest they also work for dinner. 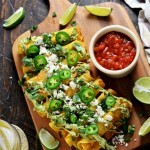 Really, taquito just means “little taco”, and we eat tacos for dinner all the time. Why not mini ones, with a side of rice and beans, right? 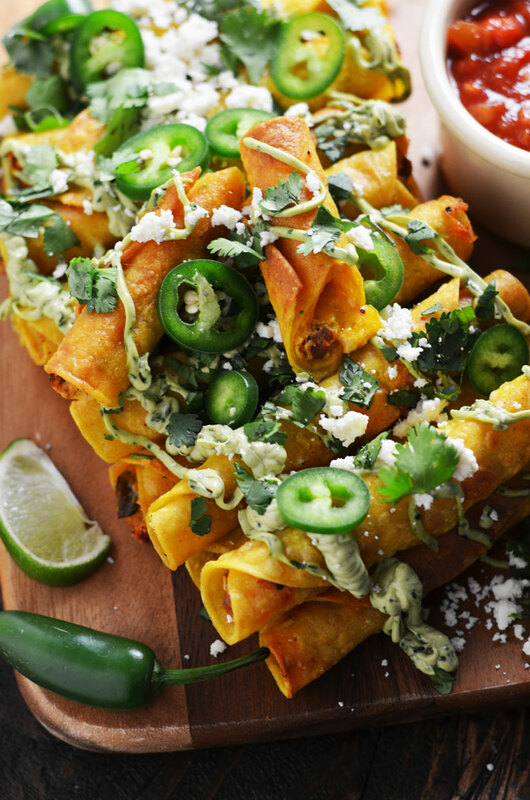 I’ll take just about any excuse to eat Jalapeño Popper Chorizo Taquitos with Creamy Avocado Sauce all day long. As if I need an excuse. 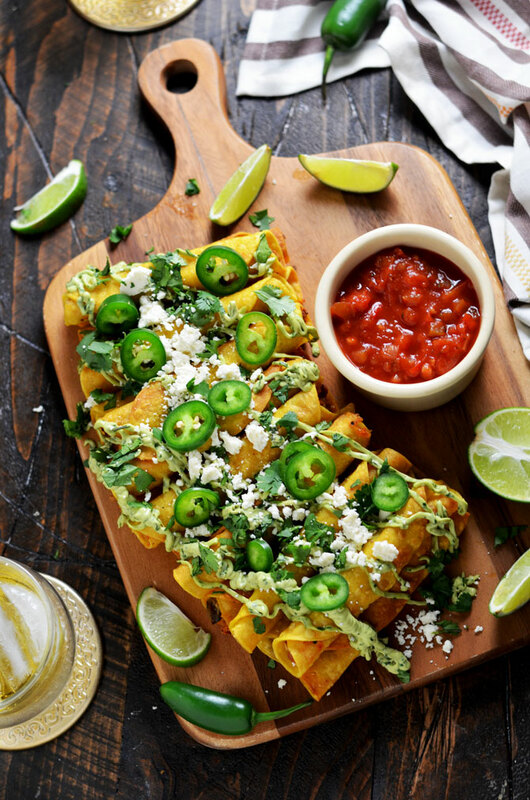 Give these Jalapeño Popper Chorizo Taquitos with Creamy Avocado Sauce a go and see what all of the hype is about for yourself. And while you’re at it, don’t forget to tag #hostthetoast on Instagram or Twitter. I bet you can’t take a picture without trying at least 2 first. Still, do try to hold off long enough to at least get a good shot of a few of them, ok? I really want to see! 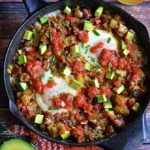 In a large skillet over medium-high heat, cook the chorizo and jalapeños until cooked through, breaking up the chorizo as it cooks. 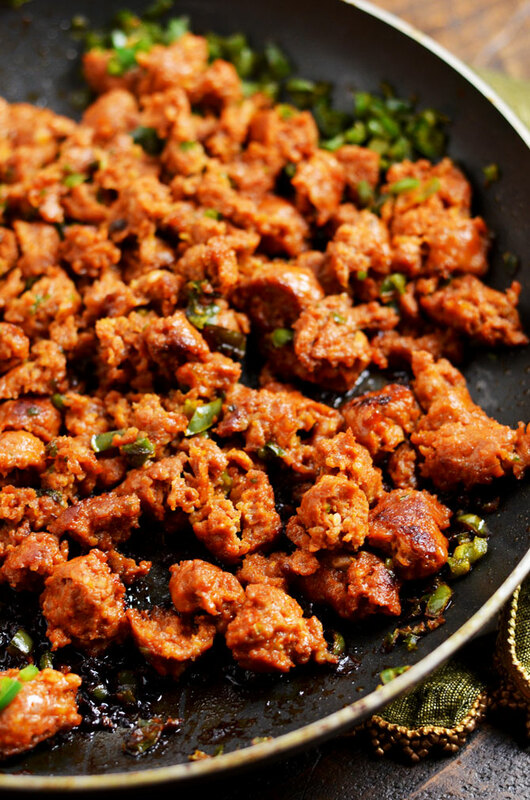 Transfer the chorizo-jalapeño mixture to a large bowl and add the cream cheese and cheddar cheese. Mix well to combine. Heat 1″ of oil over medium heat. Place 1 tablespoon of the chorizo mixture in a line down the center of each tortilla. Roll the tortilla tightly around the filling, and place a dab of the mixture right toward the inside edge, to help the tortilla stay rolled. When the oil is hot, add 2 taquitos, seam-side down, to the oil. Fry, turning as necessary, until golden on all sides. Transfer to a paper-towel lined plate to absorb excess oil and cool. Repeat until all of the taquitos have been fried. If freezing the taquitos to reheat and eat later, freeze them at this stage. As the taquitos cool, combine the avocado, sour cream, 1/3 cup cilantro, and lime juice to a food processor. Process until creamy and well-combined. Season with salt, to taste. Drizzle the taquitos with the avocado sauce and garnish with sliced jalapeño peppers, cotija cheese, and chopped cilantro. Serve warm. These look amazing! 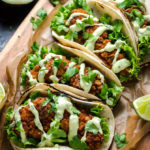 I made that avocado sauce when I made your blackened fish tacos and it was just the best thing ever. Definitely trying this soon! 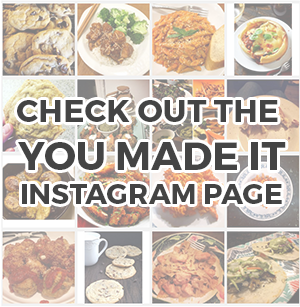 What brand of corn tortillas did you use? When I made these, I followed the directions exactly, but while these were tasty, they fell apart in the pan. I would never serve these to company with the way they turned out. I am open to suggestions. Warm up the tortillas first to soften them, put filling inside, then you roll them up, if you can’t keep them closed tight you can use a toothpick to hold them together. Hope this helps! Such a creative recipe and beautiful end result. If reheating from frozen, what oven temp and how long? 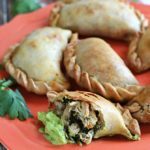 I made these vegetarian with Trader Joe’s soy chorizo and they were de-lish!